All that being said, it’s also important to not waste expensive materials and to not produce something that falls apart quickly because you didn’t take the time to look up a few basics. Even on the impulse projects, you have to consider the environmental costs of what you are doing and not send too much to the land fill. It is good to start working on impulse merely because you feel inspired. But the process can be more rewarding (both in experience and in the finished product) if the idea has first simmered in the back of your mind over time. Dolan and Gooby Inspect Fresh Concrete Liner of Tadpole Pond. I took this photo from up in the tree house, which is about 10 to 12 feet off the ground, plus the 5 feet I was holding the camera above the platform. I recently built an amphibian reproduction pond in my tiny urban back yard to help educate my son and to help preserve some biodiversity. In truth, I had thought about building a tiny tadpole pond for years, and I had long thought about how I could build one in that particular spot and how it could be designed to catch water naturally using the existing retaining wall and slope. 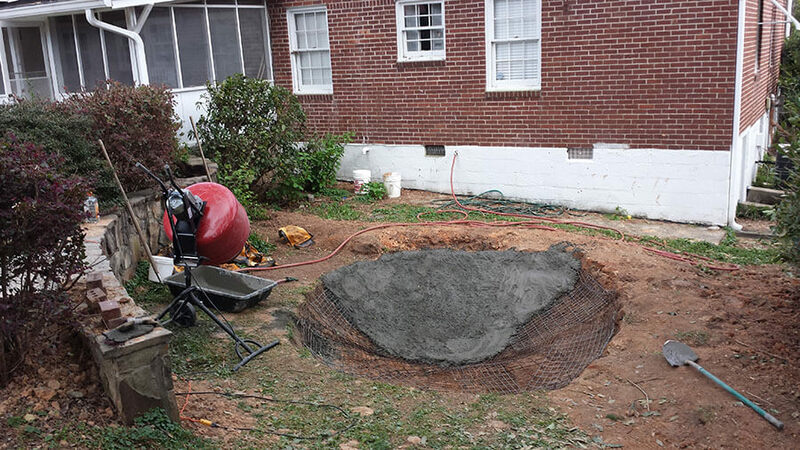 BUT I hadn’t ever fully decided on how to line the bottom and sides of the pond so that the water didn’t seep out between rains, and so when I actually started building it a few weeks ago, it was a snap decision to simply start work on it and figure it out as I went along. That afternoon had started with me just wanting to be outside with my 9-year-old son and to show him how we could dig a hole and make a fort in the backyard and just generally do all sorts of things that we can’t do on the grounds of his mother’s town home. I figured the disturbed soil would be the perfect place to sew some Native American varieties of corn and beans and squash, and I could work in some science and heritage in between our dirt-clod-throwing contests. The spring weather was beautiful, and so we just kept digging and looking at grubs and worms and all the other creatures you can find in a chemical-free yard, and before I knew it, I was shoveling the dirt into the levee I had imagined for years. At first it had been just a matter of wanting to put the dirt further from the hole so that we could dig it deeper. The tadpole place that we ended up digging is at the bottom of a small slope and is engineered to collect water naturally. What I mean by engineered is that the damn at the downhill end of the pond wraps around one side of it and up the slope diagonally to funnel runoff into the pond. It was a neat way to tuck the pond into the curve of the retaining wall and integrate it cleverly with existing natural contours. And not flood my basement or create drainage issues. A civil engineer specializing water features for high-end Japanese gardens could not have done a neater job I don’t think. It’s good to work on impulse, but it’s also good to learn from our projects and to think about what we could have done differently to improve them. I decided to line the pond with reinforced concrete instead of a rubberized koi pond liner because I wanted it to last more than a few decades and resist tree roots in the future. My justification for such a strong liner was that if an expanded population of frogs and salamanders developed around it, then it might be the only tadpole place they have access to, at least most years, and so the pond needed to be as durable as possible. In addition to durability, the concrete liner had the benefit of being a material I knew how to work with from my experience making concrete bases for mosaic sculptures. And so what is the problem? The problem is that I wanted to do this project to teach my son about ecology and how you can build and make things yourself in a frugal way. I keep driving around my neighborhood and noticing all the driveway and sidewalk renovations. All these big chunks of 4″ thick concrete that are being carted off to the landfill, and free for the taking. I could have driven my truck around in the evening an loaded up on this free material and kept it out of the landfill and avoided buying as much new concrete. It would have taken only a relatively small amount of concrete to cement these free “flagstones” into place and build the liner from that.